Not to be upstaged by the TL500, the Samsung TL350 point-and-shoot offers its own unique bag of goodies: it shoots RAW, shoots video up to 1000fps, has an AMOLED display, and can capture 10MP stills while shooting 1080p video. The TL350 sports a 10MP CMOS sensor and a 24mm Schneider lens capable of 5x optical zoom. It shoots RAW and has full manual controls, so seasoned photographers can get down and dirty. Onto the good stuff: it's one of the first non-superzoom point-and-shoots capable of shooting full-HD, 1080p video. We don't know how it'll actually look, but that's a big deal. Even more bonkers is its new Dual Capture function that lets you snap 10MP stills while you're shooting video, without having to switch modes. That's hot. When you're not doubling up, it has a burst mode in which you can shoot up to 10 full size shots per second. It's also capable of shooting high-speed video, all speeds of up to 1000 fps, though we'll have to wait and see how it stacks up against the Casio EX-FH100, the forthcoming update to the reigning high-speed point-and-shoot champ. In any event, shooting at 1000fps crams the video down to a teeny 138x78 resolution. Shooting 1080p video would be enough to grab our attention, but the high-speed video, simultaneous shooting, and RAW capabilities really make the TL350 a standout. It'll be coming down the pipeline this spring for $350. 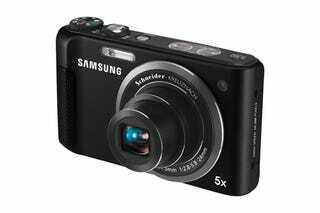 Anaheim, CA (February 20, 2010) – Samsung Electronics America, Inc., a market leader and award winning innovator in consumer electronics, today unveiled the TL350 - a high-speed, 10 mega pixel compact camera with 1080P, full-HD video recording. With a maximum video recording speed of 1,000 frames-per-second (fps) and a burst mode capable of capturing 10 full-size digital stills per second, the TL350 takes high-speed imaging to a new level for today's consumer. Additionally, the TL350 enhances the digital imaging experience with Samsung's Advanced Panorama Shot with Object Tracking as well as an innovative Dual Capture mode, which allows users to simultaneously take 10 mega-pixel still images while recording full-HD videos. The TL350 will be on display during PMA 2010, February 21-23, in the Samsung booth, #2227, in the Anaheim Convention Center. "The TL350 is representative of Samsung's strategy to lead the digital imaging industry through product innovation," said Mr. SJ Park, CEO of Samsung Digital Imaging Company. "Consumers have expressed frustration with having to choose between shooting video or taking digital stills with their camera. With the TL350, Samsung has addressed this unmet consumer need, and now gives consumers the ability to do both simultaneously." The TL350 allows users to capture high-quality images no matter how fast the action may be. Its advanced CMOS sensor and re-engineered DRIMeIII processor yield impressive low light performance and most notably, speed, giving users the ability to capture up to 10 pictures-per-second (pps) at the resolution of 10 mega-pixels. Additionally, the TL350 features a 1,000 fps (138x78), high-speed video recording mode which today's creative consumer can use to reveal details of a fast moving event in super slow motion. Whether it's used to capture an everyday moment in an astonishing new light or to analyze a golf swing, the capabilities of the TL350's super-slow motion playback are endless. In addition to its impressive speed, the TL350 also features a high-performance 24mm ultra wide angle Schneider KREUZNACH lens complete with a generous 5x optical zoom. Much wider than traditional compact cameras, the TL350's 24mm ultra-wide angle lens allows photographers to capture more of a desired scene, such as large groups of friends or family, while the 5x optical zoom will allow them to get in close when shooting from a distance. Samsung's Advanced Panorama shot with Object Tracking will further enhance the camera's wide-angle capabilities, ideal for the better capture of scenes such as vast landscapes. For blur free images, the TL350's lens is also paired with Samsung's Dual Image Stabilization technology. The TL350 will appeal to both novice and more experienced users thanks to the combination of Smart and Manual controls. The camera's intuitive Smart Auto 2.0 (Still & Movie) scene recognition technology will take the guess work out of taking a perfect photo or video every time; however, for those users who want to have more control over image capture, the TL350 supports RAW and offers Manual control. When set to Manual, consumers can experiment with features such as slower shutter speeds, depth-of-field and even focus.